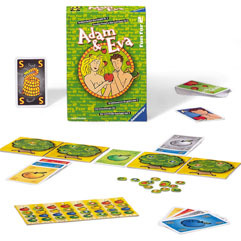 In this 2 player game, the players offer each other cards as each tries to get the most valuable apples from the apple trees. Their are four kinds of apples, each with different values. Of course, the players want the highest valued apples, but players also score bonus points when they collect all four of the same value - more bonus points for the lowered valued sets!